What they set out to do, and appear to accomplish quite well, is provide a fresh perspective to what appears to be a familiar story. Lust for Life appears to have mainly assisted van Gogh scholarship, in causing the few people who knew van Gogh who were still alive at the time of release to come forward to talk to researchers: the book and movie so badly portrayed and mangled events, and van Gogh himself. (The book's footnotes are 5000 pages long: they are not included in the book, and are available online.) I will neglect many particulars of Vincent's life here that may be familiar to you, and only deal with those in which I gained some interesting viewpoints in the book. Unlike Pollock, van Gogh was highly articulate and eager to explain himself almost to the point of mania, and in episodes, beyond it. In fact, van Gogh scholarship has an embarrasment of riches. He is an artist so talked about that the public thinks they know all about him, when in fact I often found myself surprised, and reevaluating what I knew. So they are often on firmer ground in making deductions, because they make the critical decision to fact check the statements made in Vincent's letters to Theo. This does not mean that Vincent was a fabulist, in the sense of artists like Gauguin or Gorky who clearly invented stories to create a myth. No, but he was frequently subject to delusions, obsessions, and irrational hopes and fears, as well as dependent for support on Theo, and excessively worried about what his family thought of him. Despite the love and adulation that Vincent van Gogh receives (and deserves, more about that later) he is far less sympathetic and likable in his early life than some of the romanticizers have conveyed. First of all, he had a first class intellect, and was not the instinctive empathetic genius that is often portrayed. He had to sweat through his 98 per cent perspiration once he decided on pursuing a career in art, and never developed a slick facility for achieving conventional artistic skills such as academic drawing, and his erratic, obsessive, and stubborn nature and inability to get along with people that were trying to help, or to listen to any advice that contradicted his current obsession, impeded him at every turn. He definitely had brains, and deep feeling for visual things, had drawn a lot since childhood. He also had an extraordinary visual memory, something that allowed him to do somewhat useful work at an art dealers--as long as he was in the back room. But throughout the first half of the book, he piles failure upon failure, his theological ambitions, his missionary work, his self-abnegating life with the miners, then working and getting fired as an art dealer, etc., before he even starts to pursue art, destroys his reputation with his family, and frankly pisses off everybody who could be of service to him. Depending on mood swings, he often excercised questionable personal hygiene. Because of his shifting moods and ideas, he could be very kind, ingratiating, and likable at times, and then turn very quickly towards rage. Of course, his mental problems were not developed far enough then for people to see that he was not being willfully difficult, he gave the appearance of being enough in control of himself, when that was barely the case. He did feel intensely, and was very passionate and sincere most of the time, and very sympathetic in the abstract, but he was not empathetic to what reactions others would have, he was too wound up in his own dramas and saw through the lens of his own obsessions to see how others would perceive a situation. Much of his early work is dark, forced and clumsy, and the book stresses this. In retrospect, knowing what we know, we can see glimmers of genius in these works, but his difficulties and inability to fully express what he felt must have been terribly discouraging, and they were certainly not very attractive to conventional or even advanced taste of the time. It is often forgotten that most artists turn out a lot of poor early work, sometimes totally ignored, sometimes retrofitted with 20-20 aesthetic hindsight. The point is that Vincent worked terribly hard, not having a natural facility, and his manic and obsessive tendencies, which cost him so much, really appear to have helped him here. I learned that he also had the presence of mind and originality to pick up and retain any new techniques he developed, such as the use of line as texture in his drawing, which later guided his hand to build the rhythms of his impasto wet on wet. His refusal to listen to Theo's advice to lighten his palette, an excellent example of his stubbornness, cause him to have to develop a facility for working quickly with condensation and few brushstrokes, because working on a black background, his modeling would sink in if he overworked it. These skills, earned by intelligence and hard work (and many wrong turns) serve him well when he arrives at his signature style. During this period Theo thinks little of his work, but tries to encourage him. At just the half way point in the book, Vincent discovers color, and everything starts to come together for him. His ability to work hard, and persevere, and his manic energy, combined with his ability to draw with color and economy and speed is perfectly suited to an Impressionist and Post Impressionist aesthetic. These manic periods of truly productive work, give him the first positive feedback, but they alternate with terrible emotional, and then psychotic crashes. I think that Vincent had an unequaled gift to convey a supernaturally living intensity though vivid painted color. And for that gift, we are eternally thankful and grateful. I won't go into the familiar stories, but I think that there is a temptation to look for villains, and I think that this book is fairer to Gauguin than most. Pirate like, ambitious, and looking for advantage, still yet, who could actually stand living in close quarters with Vincent? In fact he was not the first choice to share the Yellow House, and to be fair, Gauguin did not really push for it either. But once Vincent decided it, Gauguin was harranged by Vincent, and subsidized by Theo to make the trip. Nothing Gauguin did was really responsible for the collapse and the cut off ear, as Vincent regularly had emotional crises around Christmas time, and I suspect Gauguin left both terrified and worn to a frazzle. The book points out that Theo was Gauguin's dealer, and Gauguin had every self-interested reason for sticking it out and remaining on good terms with the family. Everyone wants to play amateur psychologist with Vincent, and we can't really harm him any more than the doctors of his day, who had fundamental conceptual difficulties with periodic mental illnesses; they thought you "got sick" or "got well" or maybe you had a nervous weakness, that made you "susceptible" to another attack. Based on reading this book, I think that Vincent had multiple problems. My guess is that he had at least two intrinsic conditions, severe bipolar illness complicated with significant seasonal affective disorder, and what has been called temporal lobe psychomotor epilepsy, or some other progessive condition that causes psychotic brainstorms from psychological triggers. In addition to these two organic conditions, it is certainly true that Vincent had syphillis, which may have reached the tertiary state and kicked in on top of these two conditions, attacking his brain towards the end of his life. In addition, there is the possibility of a fourth, heavy metal poisoning, which affects mental function and exacerbates irritability. Almost all brilliant colors available in his day were based on toxic metals: lead, chromium, cadmium, cobalt. Vincent often sucked on his brushes when thinking. If he was negligent in cleaning them (and I would be surprised if he was not at times) there could be residues, generally a bad idea, even if an artist is meticulous about cleaning. During his hospitalizations he was allowed to paint when lucid, but on more than one occasion, he had a sudden attack and swallowed his paints before he could be prevented. Everybody takes note of the fact that few people even wanted these canvasses that are now worth billions. But in paying attention to the chronology, the story is even more tragic. His use of imagery as symbols and divided regions of color, use of color as an expressive force, rearranging nature to develop expressive force, experiencing the forces of nature and painting outside, developing an individual style--his dynamic brushstrokes, and even the cult of the artiste maudit, the artist as outsider, as madman, all of these converged as THE critical consensus of the emerging art of the 1890s. This was exactly Vincent's moment. At precisely this point, Theo was starting to get inquiries about purchases. Vincent dominated the Salon des Independents with a staggering collection of works. In spite of the famous artists participating, Monet, Gauguin agreed that van Gogh was the stunner of the show. Albert Aurier released a rave review about the disturbed but great genius. And a painting was purchased. Not much, but remember that Gauguin had only begun to sell, and a massive change in taste was underway. And at the very moment that all this was happening, Vincent was hospitalized, and in a delirium, and only had a handful of months to live. I admit that at this point, I began to cry. After Vincent's death, Theo, guiltridden and griefstricken, made every effort to try to redeem his brother's reputation. Theo, who had a full blown case of tertiary syphilis, further progressed than Vincent's, collapsed under the strain, went insane and died. Vincent's desire of making a successful partnership with Theo was very nearly achieved. I would add, the book in an appendix speculates on Vincent's death and comes up with the rather sensational non-suicide theory. The ideas are not unreasonable, as the actual story that is usually told is full of holes. The ideas are labeled as speculation. This autobiography deservedly netted a lot of book awards, including the Pulitzer. I'm going to do a fairly detailed review, but it only scratches the surface of this book, and is no substitute for reading it. The book extensively details his Dutch background, both his troubled home life--with an abusive mother--and his short but thorough grounding in academic drawing, leading to early success in commercial art and as a chief artist in Dutch design firms. At first, he never thought of himself as a fine artist, but as a commercial and decorative painter, who privately painted for himself (at that point in a somewhat symbolist or Art Nouveau manner) --ambitions and expectations that he carried on into his journey as a stowaway to America. Early on, he exhibited a somewhat American entrepreneurial spirit, and preferred to move from working for established companies to freelancing. This background helps in understanding many aspects of his later career. His training at the Academy had not included the more advanced classes in perspective, nor painting. Perspective was not particularly an issue for the shallow space used in magazine illustration or commercial advertising, nor when developing his own style in a modern or abstract idiom, based on a flat sort of Cubist type space. He was never interested in vast battle scenes or complex architectural views. Nonetheless, he seemed to exhibit early on a deep seated need for self-contradiction or paradox, by sticking difficult foreshortening into straightforward abstracted figuration, punching and flattening space into a worried surface that defied a single reading. His training in painting came from commercial firms, and gave him practical experience in many ways that he might not have had an opportunity to learn at the academy, including shortcuts in layout, and preparation of paint. In painting, he utilized a lot of techniques that he had learned as a commercial illustrator in innovative ways in fine art, in terms of layout, transfer of images, and manipulation of materials in his paintings. He developed an art practice of using vellum-tracing paper- to cut up and transfer shapes, and even lift paint from painting to painting. At one point in his life, he decided to stop doing commercial art and paint full time. This was a risky and conscious choice and one that his free lancing personality was willing to accept, to spend a long time, "broke but not poor", as he put it himself. Luckily, New York turned out to become the kind of art world crucible for the emergence of a new kind of painting, and interaction with other artists on the cutting edge. Particularly he picked up art theory, and techniques from Arshille Gorky, a brilliant abstract painter and autodidact, and many others, such as the extravagant John Graham. If I went into detail, this would turn into a list of famous artists, like Jackson Pollock: read the book, OK? Returning, now to his restlessness and inability to settle down. His life was filled with paradox and disruption that seems to have been prepared by his early years. His mother was physically abusive; he loved her but disliked her. His early family life was unstable. In a strange way, he seems to have been prepared to react with both anxiety and comfort in unsettled situations, and to seek them out because of their familiarity. For a long period of apprenticeship, he labored over, and endlessly reworked paintings, and continuously brought new and difficult complications into his work that were, by their very nature impossible to take to a single resolution. He developed an underground reputation as an academically trained and skilled painter, who could draw like Ingres, but chose not to, who worked incessantly on strange paintings, but who could never finish anything. 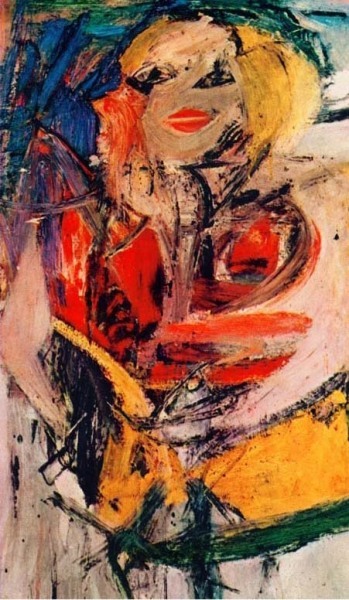 Psychologically, de Kooning was a bundle on anxiety. He gradually learned to turn this irresolution into a kind of aesthetic, where he would bring several different things into a painting, let them fight it out, and consider a painting done when it had in his terms a "visage": a kind of theme of fragile dynamic balance. The hallmark of all his multiple styles is the ambiguity of figure and ground; the "background" will suddenly pop forward and the "foreground" recede, so that multiple paintings are embedded in one, in a disquieting and unrelenting energy. I am consciously not going to go into details about each of his several or so major styles; this review is long enough, and the book comes with adequate color illustrations, and there is plenty of material in the literature on them. In his work he tended to build up anxiety, which would then explode into a manic burst of activity, often in a totally new style. 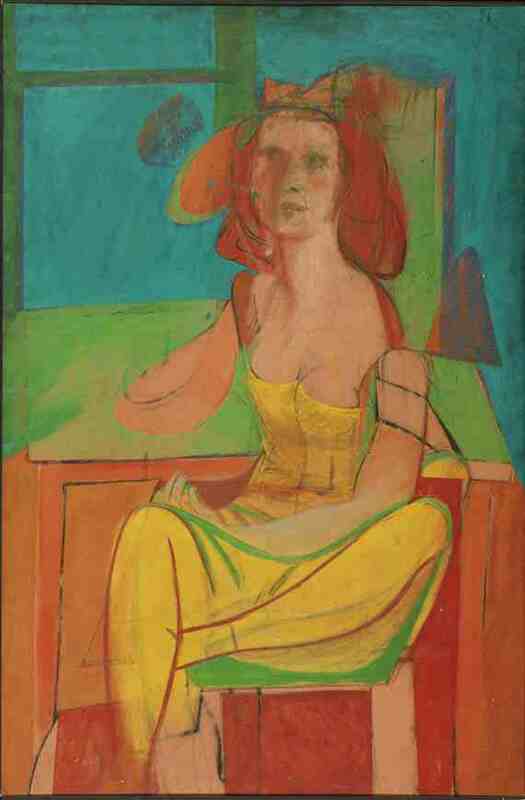 (Many people only know, and dislike (or like) de Kooning on the basis of one style, he had seven or eight.) Then he would fall into anxiety again. De Kooning was no exception. He soon feel into a cyclic pattern of alternating his periods of manic creativity alternating with manic binge drinking. For the most part, the first part of the cycle, de Kooning was alert, witty charismatic, and would pretty much go without sleep for three or four days, then he would fall into a stupor, and finally black out on the street, in an alleyway, or in a park, and his many friends would have to organize a search to locate and rescue him. In his life he would never resolve anything. He lived alternately with his wife, the mother of his child, Joan Ward, and several different girlfiends. In this particular aspect you can see a commonality between his art and his life. He was not consciously cruel in in this bohemian life style, just rather helpless to live any other way. His daughter Lisa said that he was definitely not a good father, but she was just as equally certain that he loved her very much. At this point he had become enormously successful but was a very troubled man and deeply sunk in alcoholism. 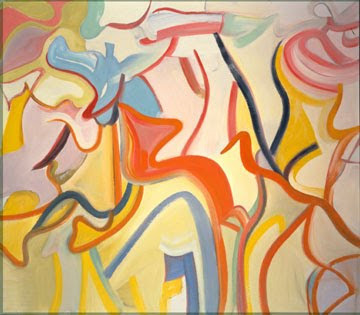 His wife, Elaine de Kooning, an artist with a significant reputation in her own right, came to have more of an influence in his life again after a number of years. She was a heavy drinker too and started to try to get fellow artists to go on the wagon after she joined AA. 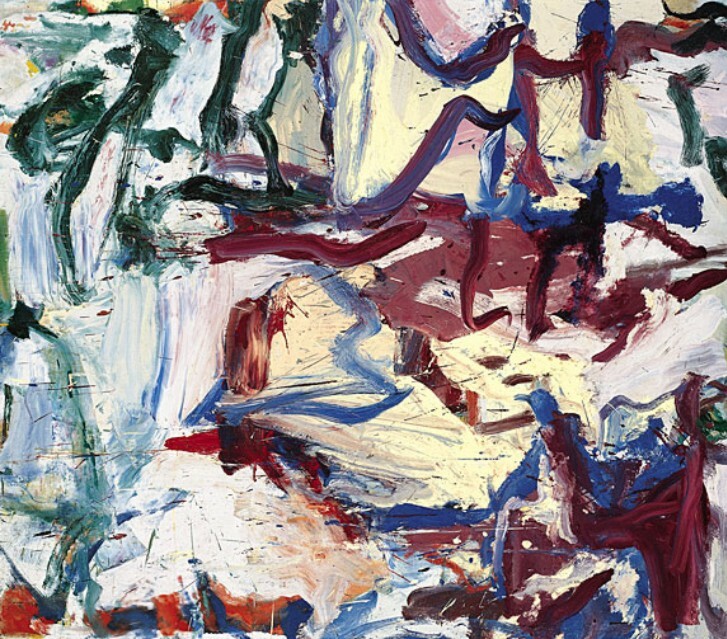 She set a project to get de Kooning dried up, and reorganize his life. As a result, he was able to have a very long and productive life. His art started to take on a light, fluid pastoral quality, more influenced by Matisse and impressionism, less edgy, and more graceful. But not so fast. It was a sad ending. After a number of years, when he reached old age, he began to suffer significant memory lapses. He had significant cognitive reserves visually; it was said if he couldn't remember someone's name it would come to him when he drew them. Ultimately the diagnosis was Alzheimer's. He continued to paint for a number of years; Elaine organized the studio so that all his equipment and paints would be set out for him, and all his legal and routine affairs would be arranged. There is general consensus that this studio routine kept off the onset of dementia for a number of years as his mind was actively engaged. There is also somewhat of a critical consensus, that although not as edgy and anxious as his earlier work, his better late "ribbon paintings" take on a beautiful elegance and compression, and do indicate an artist at the top of his craft. This is an abstract that does suggest something of an aerial perspective such as that seen by an airplane. This is a fairly large picture, 24" high by 30" wide. Mediums: acrylic paint, acrylic skins, acrylic transfer of color survey map, photocopies of scanned images, newspaper. I got very interested in acrylic transfer of images some time ago and have been using it in my abstract paintings. The paper is pressed image side down onto the acrylic medium and then removed when dry. I get a lot of accidents that way too, as I can never get the transfer "perfect", little nicks or worn away spots add more interest, and keep me on my toes. I sometimes fix up details with paint so that you don't even see them, or I let them show when they look interesting. My neighbor was throwing away a thick role of old maps and building plans in a "FREE" pile outside his house. I thought I might use them some time. A little voice told me, no, you always say that, you mean to use it some time and you never do, and you end up with a lot of junk, but I told the little voice to shut up and found a place for them. With composition, usually improvise. In this one it was especially so, as I had to play it by ear there were so many competing images and so many colors brought into the mix right away, although the painting early on seemed to resolve itself into four areas, reading counterclockwise, 1) an area of red, yellow and purple accents on a peach background, 2) an area of white and red on a background of warms and greens with newsprint transfer, 3) an area of pink with mostly xerox transfer, and 4) a large area of green with most of the map in the upper right. The lines of the map sort of fulfilled the "drawing" part of this project, although I often do mixed media with drawing I do myself. The contours of the map seemed to echo the arcs in the images that I had in the xerox transfer. I used sgraffito and tiny painted lines to echo the grid of the map. I brought in painted arcs of varying sizes to transfer the eye between areas. *Sigh* I had already varnished it. It's acrylic, so it had had several days to cure. I decided to go ahead and remove the MSA varnish from the area, reduce the contrast of the line, put an isolation coat on it, and then revarnish the detail! Well, fortunately, that worked. In fact, I was gratified that it was selected for the best submission of December 2011. Easy acrylic skins--paper palettes--cutting out the sections you want and transfer them face down onto the acrylic gel. The isolation coat will protect the painting if you ever have to remove the varnish, even if you thought that was something that would be done by your great grandchildren after you are dead, or surprise, you really, really can't stand a detail. To remove an MSA varnish use Gamsol or mineral spirits. To remove a DETAIL (warning-this is NOT for the faint of heart) mask off the surrounding area with wide painters tape. "Pigment flying upward and outward, the artist had snarled up browns, dark greens, blues, viridians and, most strikingly, pink corals, roses, and orchids, amid whites helter-skelter with flecks and cascades of drips." You may find yourself rooting for her in the end, as she continues to create passionate, enormous canvases to the very end, as her body totally falls apart. So far I am scheduled for two shows in 2012. "...even more important than the painting we make is what happens to us when we make it..."